The Russian ambassador to the EU warned Tuesday (9 September) that an Ukrainian admission to the North Atlantic Treaty Organisation (NATO) would create the biggest security risk in Europe since the fall of the Berlin Wall, and warned against hardliners in Kyiv who may seek to derail a fragile peace process in eastern Ukraine. Vladimir Chizhov, who met with a group of Brussels-based journalists, conveyed the message that his country saw Ukraine’s bid to join NATO as a red line not to be crossed. Ukrainian Prime Minister Arseny Yatsenyuk had said on 29 August that his government will introduce a proposal in Parliament to change the non-aligned status of the country, and to request membership of NATO. The NATO summit held in Cardiff, Wales, held on 4-5 September did not respond to Ukraine’s proposal. However, its final document says that NATO’s door will remain open to all European democracies which share the values of this alliance, which are willing and able to assume the obligations of membership, and whose inclusion will contribute to the security of the North Atlantic area. Russia appears to be hinting precisely that the inclusion of Ukraine will undermine the security of the continent. “Ukraine in NATO would be an unprecedented challenge to European security, the biggest since the collapse of the Berlin Wall,” Chizhov said. Another message he conveyed is that Moscow made a distinction between the President Petro Poroshenko and what he called “the Party of War in Ukraine”. Chizhov hinted that Poroshenko had interest for the agreed cease-fire to hold, while “the Party of War” had other plans. The ceasefire, which took effect on Friday evening, is part of a peace plan intended to end a five-month-old conflict the United Nations’ human rights envoy said had killed more than 3,000 people. The truce was largely holding yesterday (8 September) and the EU delayed the enforcement of newly agreed sanctions. 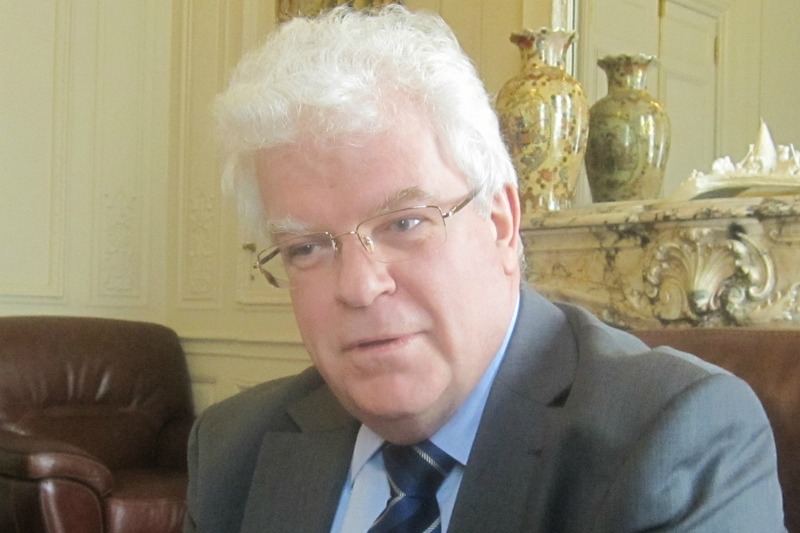 Chizhov hinted that Ukrainian hardliners could derail the peace process, and that he had been conveying this message to his various EU interlocutors. “Our message to the EU is: Don’t undermine the Ukraine peace process by supporting the Party of War in Ukraine,” the Russian diplomat said. In the meantime, the Ukrainian ambassador to the EU Kostiantyn Yelisieiev urged the EU to implement the newly adopted sanctions without delay (see Positions). It is not the first time that Chizhov has hinted about divisions between the Ukrainian elite. In an interview with EURACTIV last June, he suggested that “other political figures that have already felt the sweet taste of power”, since what he calls “the February coup” can have different agendas with respect to Poroshenko. “We welcome the adoption by EU member states of a new package of restrictive measures against Russia within the third level of sanctions in accordance with the Conclusions of the European Council special meeting of 30 August. release of Ukrainian citizens illegally imprisoned in Russia. Recent arrangement of the Trilateral contact group must not create any illusions: so far the Russian side has not fulfilled key demands of Ukraine and the EU. We should neither forget about the illegal annexation of the Crimea which will never be recognized by the international community. Only a smart combination of diplomatic efforts and consistent motivating pressure by the EU are able to establish favourable conditions for implementation of the Peace Plan of the President of Ukraine based on ensuring the independence, sovereignty, territorial integrity and European choice of Ukraine”. NATO leaders made clear at a summit in Wales that their military alliance would not use force to defend Ukraine, which is not a member, but planned tougher economic sanctions to try to change Russian behaviour in the former Soviet republic. Ukrainian President Petro Poroshenko, who was present at the 4-5 September NATO summit, also took centre stage at the 30 August EU summit, where he said that the EU's agenda from now on would largely revolve around Ukraine. At the summit, some EU leaders reportedly spoke about the need of military assistance to Ukraine, many demanded tougher sanctions, but reportedly Slovakia, Hungary and Cyprus made it clear they oppose further sanctions which they claim would hurt their countries more than Russia. EURACTIV Greece: ????? : ???????? ?????????? ????????? ??? ??????? ??????? ?